The first step is to get the file into place to edit it. 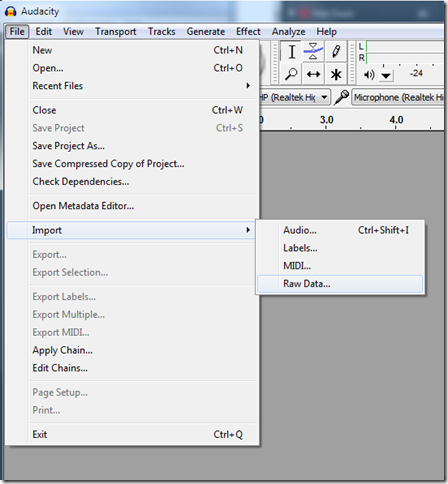 With supported file formats, you can just drag your files onto the work stage or do a “File – Open”, but because my cousin had a PCM file, we needed to do a raw-data import. If I didn’t know anything else about the file, I’d just hit the import button and see what happens, but we already know there’s a speed problem. The first solution is to fix the sample rate. 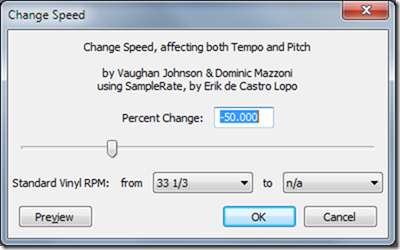 I know that most software lets you manipulate the sample rate by doubles. So if the sample rate is too fast, my first guess is to halve it, 22050. 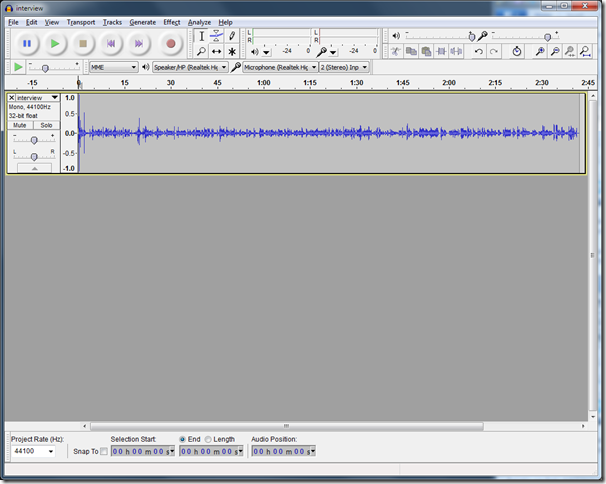 And when I do import the sound file, I can hear my cousin’s voice, sounding much more like herself. 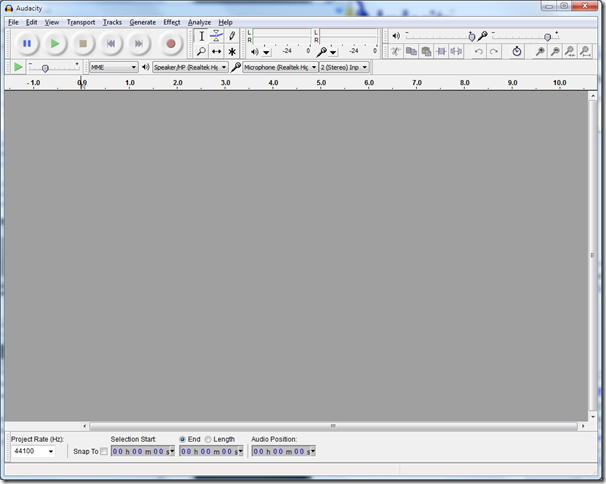 Mission accomplished, now to just save the file. If it hadn’t worked, I’d have cut the sample rate in half again, 11025 and seen what it did. 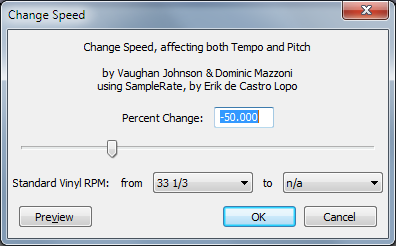 But let’s say that I didn’t know what the sample rate should be, or I didn’t get this little popup. There’s another way to solve this one. 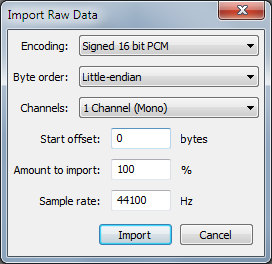 Say I’d imported the file at the original sampling rate of 44100 hz. 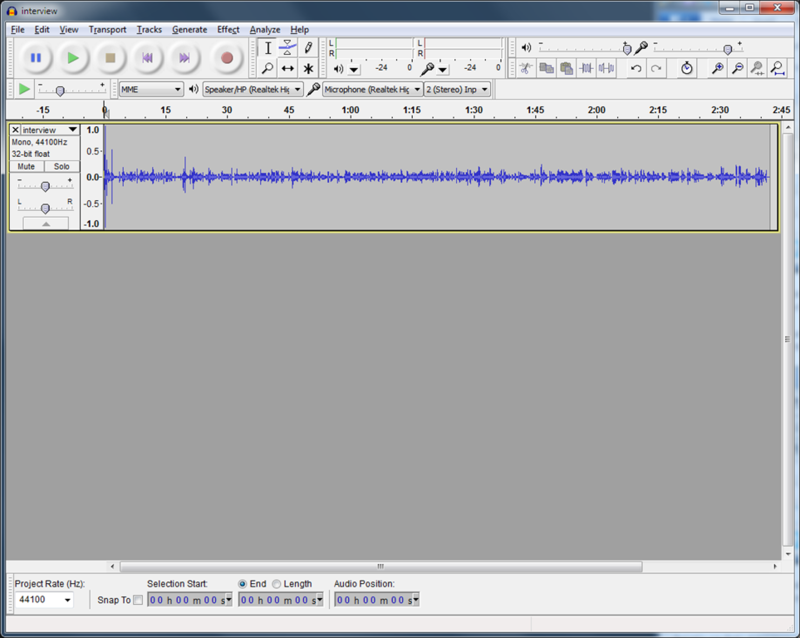 Now I have a sound file, and it’s too fast. The solution, select the entire recording, by mouse or using the edit menu, and pick the “Change Speed” effect. I want to slow it down by a half, so I put in -50%. 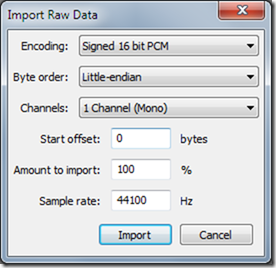 Which again restored the smooth sound of my cousin’s recorded voice, but the fun thing about this dialog is that you can change it any amount you want, without really having to know the math or specific sample rates. 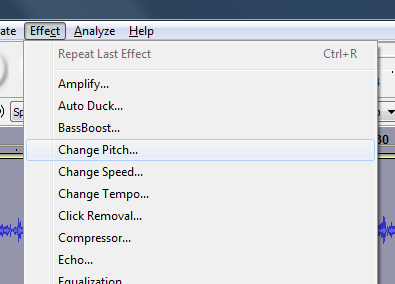 This is also a great effect for when you don’t want to fix a file, and you *do* want your voice to sound like a cartoon chipmunk. 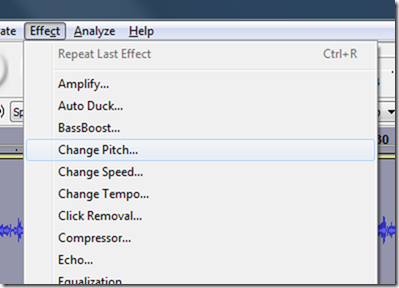 Try speeding things up by 50% or more, and see what happens.